Public officials and engineers have long warned about the dangers posed by the outdated, moldering pipelines that snake beneath the streets of major cities like New York, feeding gas into the furnaces of millions of homes. For nearly two decades, federal authorities have directed pipeline operators to replace these leak-prone, cast-iron lines with pipes made of plastic and other modern materials. And many states, including New York, have embarked on programs to do just that. But these efforts could take decades to complete, and in the meantime, weakened pipes could spring deadly leaks. This possibility and the need for repairs have come into sharp focus in the aftermath of an explosion that tore apart two buildings in Manhattan on Wednesday morning, killing at least seven people and injuring dozens more. "The human cost of inaction is clear," said Ydanis Rodriguez, a New York City councilman, in a statement to reporters. "If the necessary funding for these repairs and improvements is not granted by the federal and state governments, tragic occurrences such as today's may become more common in our city." It's not yet clear what caused the leak that led to the explosion. Records show that the city approved a permit to replace 120 feet of gas piping last summer for a heating system at one of the collapsed buildings. The company that did the work, New York Heating Corp., did not return calls seeking comment. But a Consolidated Edison spokeswoman, D. Joy Faber, confirmed to HuffPost that the main pipe that funneled gas into the heating systems of the now-obliterated East Harlem buildings was partly made of cast iron and dated back to 1887. And as several engineers and officials noted, that can be a problem. Compared with a more pliable material like plastic, cast iron becomes brittle over time. A heavy blow can crack the pipes, and so can ground movements caused by alternating spells of warmth and cold. Federal data on the integrity of gas mains show that serious leaks causing death, injury or major property damage stem from cast iron pipes four times more often than those made from other materials. In January 2011, a leak in a cast-iron gas pipeline in Philadelphia led to a blast that killed a utility worker and injured five others. 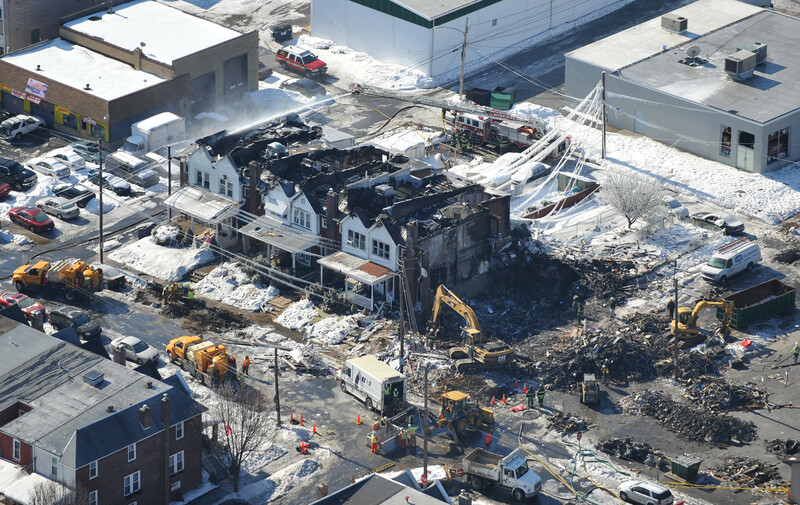 Fuel from another leaky cast iron gas main caused a major explosion in Allentown, Pa., a month later, killing five people, including a 16-year-old girl and a 4-month-old boy. Con Edison officials said they are treating the explosion in Harlem as the result of a gas leak, but they are still investigating the cause of the accident. Faber, the spokeswoman, said the company surveyed the gas main near the building collapse as recently as Feb. 28 and detected no leaks. Cast-iron pipes are especially common in old, large cities like New York, Philadelphia, Washington, D.C., and Boston, where some of the lines date back to a time before the widespread use of automobiles and electric lightbulbs. Federal data from 2012 show that nearly a third of gas lines overseen by operators in Washington, D.C., and Boston are made of cast iron, and nearly half of Philadelphia's lines are made of the antiquated material. "Whenever the infrastructure went in, people used what they had at the time," said Brigham McCown, a consultant and former administrator of the U.S. Pipeline and Hazardous Materials Safety Administration. "By and large in most American cities, that's a cast iron-type product. It becomes brittle, it becomes harder, and it's more difficult to get a seal." Just one day before the Harlem explosion, a New York City public policy group released a 66-page report detailing an extensive list of problems plaguing the city's aging infrastructure, noting, in particular, the prevalence of cast iron distribution lines for natural gas. The report from the Center for an Urban Future found that nearly half the gas mains under the oversight of National Grid, a utility company that provides heat to buildings in Brooklyn, Staten Island, and parts of Queens, were made of cast iron and another leak-prone metal known as "unprotected steel." Con Edison, which oversees the gas mains in Manhattan, the Bronx, and northern Queens, had an even higher proportion of questionable pipes. Sixty percent of the company's gas pipelines are made of unprotected steel or cast iron, and they date back more than half a century on average. The report also observed that Con Edison experienced a much higher leakage rate than National Grid, with 83 leaks for every 100 miles of main in 2012, compared with National Grid's rate of 45 leaks for the same amount of pipeline. Graphic courtesy of the Center for an Urban Future. Acknowledging Con Edison's goal of replacing 30 miles of cast iron pipe each year, the report advised that a "more aggressive replacement schedule may be warranted." Yet the costs of replacing cast iron pipes are high, especially in crowded urban areas with heavy traffic. The cost of pipeline replacement typically falls to energy companies like Con Edison, which bear responsibility for the upkeep of the lines. The state commissions that regulate these utilities only allow them to pass on a portion of their repair costs to consumers. Some experts say this creates an incentive for the utilities to stretch out the repair work over many decades to keep costs in line. "It's all about money," said Bob Ackley, a former gas leakage specialist and the owner of Gas Safety Inc., which tests for leaks in homes and businesses. "At the end of the day, these guys have been rolling the dice for years with cast iron. They just try to catch these before they cause an explosion." In 2010, Con Edison planned to replace 40 miles of cast iron and unprotected steel gas mains every year, at an estimated annual cost of $85 million over the next 20 years, according to a document describing the company's long-range pipe-replacement strategy. Faber, the Con Edison spokeswoman, said the company has since increased its commitment to 65 miles per year at a cost of $110 million per year. But at the current pace, it would still take the utility more than 35 years to replace all the cast iron gas mains in New York City, according to federal data. And that's not even a particularly long time, by the standards of other areas where cast iron gas lines are prevalent. According to a 2011 survey from the National Association of Pipeline Safety Representatives, Connecticut estimates that its cast iron pipes will be phased out by 2080; New York State by 2090; and Pennsylvania by 2111. Sen. Ed Markey (D-Mass.) introduced a bill in November that aims to accelerate the pace of repairs by targeting the highest-risk pipelines for replacement. An accompanying bill would provide funding for the project through a combination of federal and state matching funds. In a statement at the time, Markey argued that the legislation would not only prevent disasters, but would also cut down on air pollution and protect consumers "from being charged for gas they may never get." According to a study by his office, American consumers paid at least $20 billion between 2000 and 2011 for natural gas that escaped through leaky pipes into the atmosphere. A team of researchers from Duke University and Boston University recently investigated gas leaks under the streets of Washington, D.C. and Boston, identifying 3,300 gas leaks in Boston and nearly 6,000 in Washington, D.C. over a period of about two months. They attributed the pervasive leaks to the abundance of cast-iron piping in those cities. Robert Jackson, a professor of environmental sciences at Duke who led the studies, said the data clearly show a need to accelerate the replacement of aging pipes. "The take-home message is we have to speed the repair and replacement of this old infrastructure," said Jackson. "By fixing these leaks earlier on, you can improve consumer safety, improve air quality, save people money, and even reduce greenhouse gas emissions." Nathan Phillips, a professor of earth and environment at Boston University who worked with Jackson, likened the risk of aging gas lines to that of an earthquake. "These are low probability, high significance events," Phillips said. "We live with those risks. They're individually small, but they're going to happen somewhere, sometime."